'Wabash Cannonball' is an American folk song about a fictional train, thought to have originated in the late ninteenth century. Its first documented appearance was on sheet music published in 1882 titled, "The Great Rock Island Route" and credited to J.A. Roff. 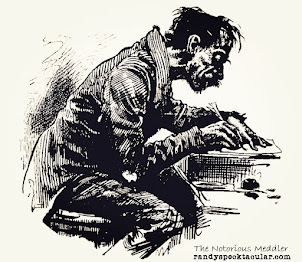 A rewritten version by Wiliam Kindt appeared in 1904 under the title, "Wabash Cannonball." The Carter Family made one of the first recordings of the song in 1929, though it was not released until 1932. 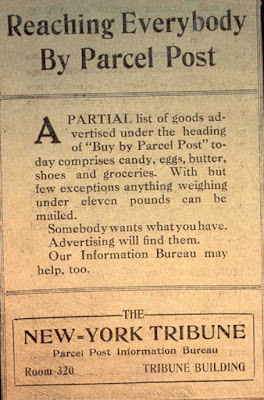 The most popular version, however, was recorded by Roy Acuff in 1936. The Acuff version is one of the fewer than thirty all-time singles to have sold 10-million (or more) copies worldwide. In 1932, Dr. Hauer's Medicine Show, which toured the Southern Appalachian region, hired Roy Acuff, as one of its entertainers. Acuff left the medicine show circuit in 1934 and began playing at local shows with various musicians in the Knoxville area. That year, Acuff formed the Tennessee Crackerjacks, which performed regularly on Knoxville radio stations WROL and WNOX. Within a year, the group had changed its name to the Crazy Tennesseeans. Acuff quickly became popular and, in 1936, was asked to record the song for Okeh Records, a division of the America Recording Company. So, Acuff headed north to Chicago for a recording session which resulted in 20 different songs, including 'Wabash Cannonball.' The recording featured Acuff imitating the sound of a train whistle, but not singing the lead. That part was sang by Sam 'Dynamite' Hatcher. 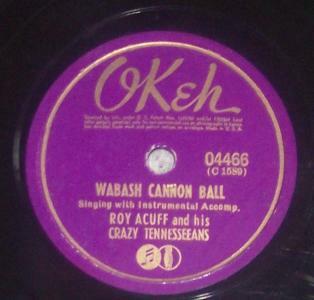 Acuff's original 1936 recording of Wabash Cannonball (Okeh 04466), is part of my collection of 78 r.p.m. records.